The unit is fitted with two independent infrared illuminators for long and short range detection in very low light/total darkness. The Tracker PRO 2x24 offers 2.0x image magnification and a wide 30º field of view. 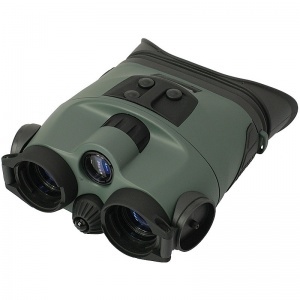 These Yukon Tracker night vision binoculars are compact and lightweight with a functional design that is easy to use and comfortable to hold. The smooth centre focus wheel, raised latching switches and eyepiece focus/dioptre adjustment levers make locating and using the controls quick and simple. Twin operational status LEDs illuminate green and red depending on the active features and alert the user should the device be accidently switched or left on. Each Tracker model is fitted with two high grade Gen 1 image intensifier tubes that are colour and gain matched for optimum performance. The wide exit pupil diameter from each ocular negates the need for interpupillary adjustment, which in turn gives a less complicated design and stronger bodyshell. All models have a built-in IR illuminator while the Tracker Pro 2x24 has a secondary low power wide angle IR illuminator suitable for close quarter illumination in very low light and total darkness. Each has a tactile sure-grip ABS plastic bodyshell with partial rubber armouring for added protection and hold, a stylish green/black on the Tracker Pro 2x24 and Tracker LT 2x24 but coloured blue/black on the Tracker LT WP 2x24 because of a higher level of water resistance, being waterproof to IPX5. Powered from a single 3v Lithium CR123A battery (not included) and with 2.0x magnification and a wide 30º field of view, they are all individually serial numbered and supplied with a detachable neck strap and a soft carry case.